When I was pregnant with both my kids, my favorite thing to do was take long scenic car drives—anywhere and everywhere. I&apos;d recline my passenger seat, turn on the radio, and take in the sights, sounds, and scenery. My husband and I would stop for lunch, take a leisurely stroll (I&apos;d waddle), and then we&apos;d head back home on another mystery route. It was a way for me to focus on something other than being hugely swollen and uncomfortable. But I digress... I&apos;ve always loved exploring new neighborhoods and cities and discovering exciting destinations. I think these long car rides prepared my in-utero children for future road-trip journeys—that the steady feel of the car and road made them born for epic travel adventures. 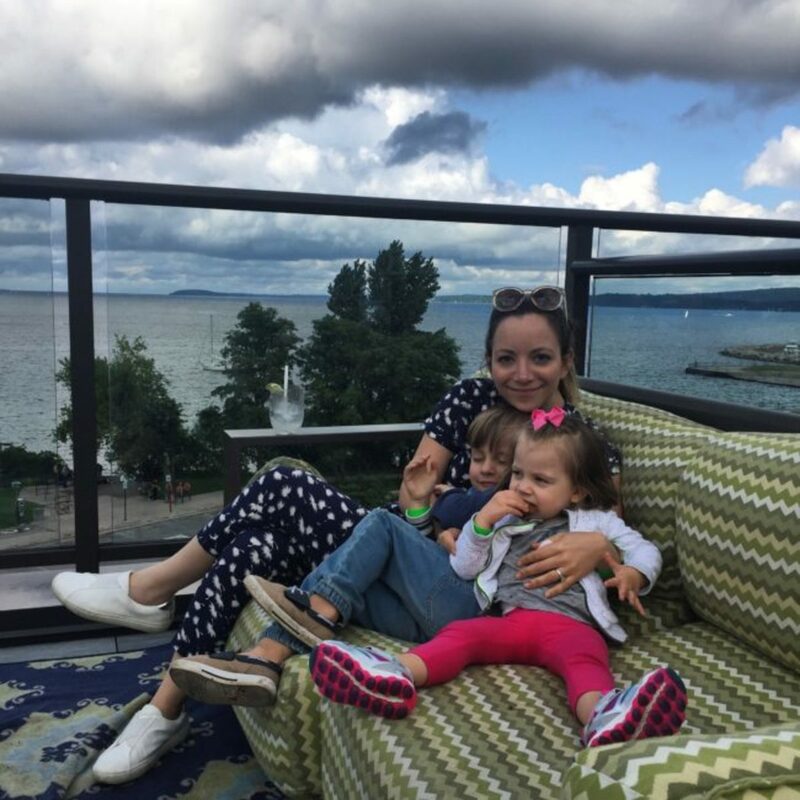 Needless to say, our family loves a good road-trip; so when Chevrolet invited us to explore Traverse City, Michigan in the completely redesigned, brand new 2018 Traverse, we were eager to accept. We hopped on a quick flight to Detroit, and got ourselves acquainted with our totally souped up and shiny new SUV. 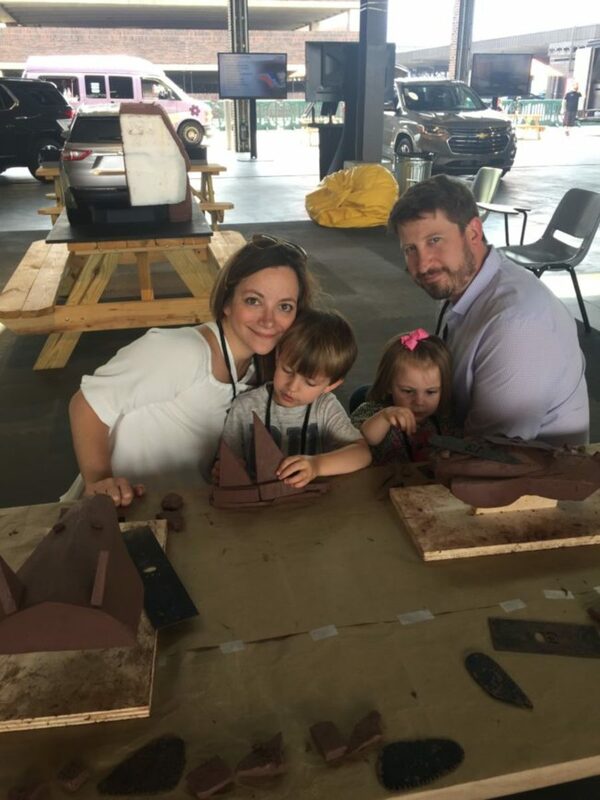 While my husband and I learned all about the vehicle&apos;s features (highlights: a seemingly magical backup camera, hand-free gesture lift gate, hidden storage, smart-slide seating, and amazing connectivity--more on this later! 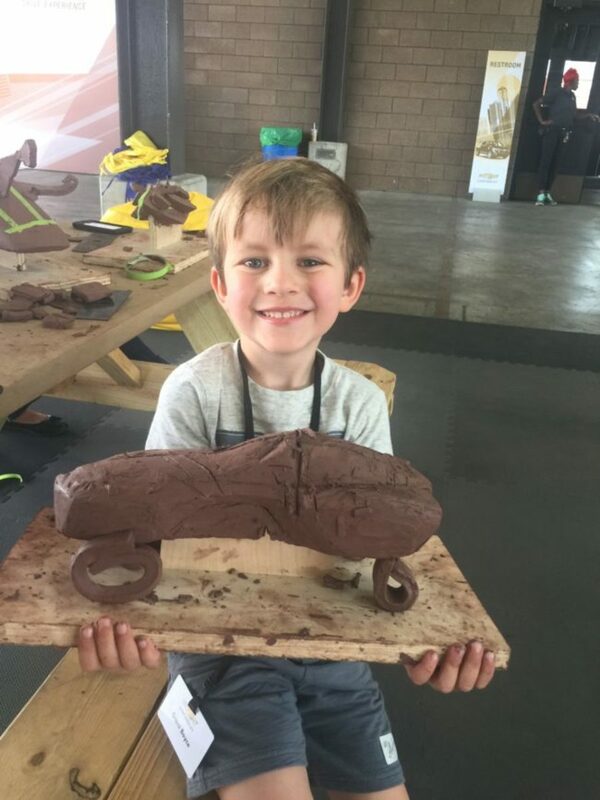 ), our littles got a lesson in making clay-model cars from real GM designers. It was a blast for everyone, but Traverse City was waiting, so we secured our car seats, synched our iPhones, and hit the road. 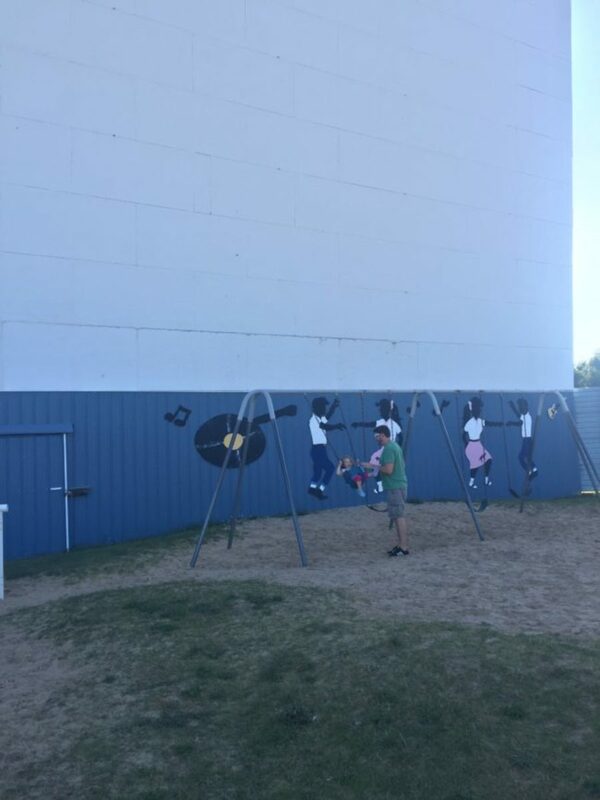 As first-time tourists in this northern Michigan town, we were happy to discover that Traverse City is chock-full of fun, sun, and family adventure. We fell in love with the area—and learned why it&apos;s such a great getaway for couples, friends, and fams. 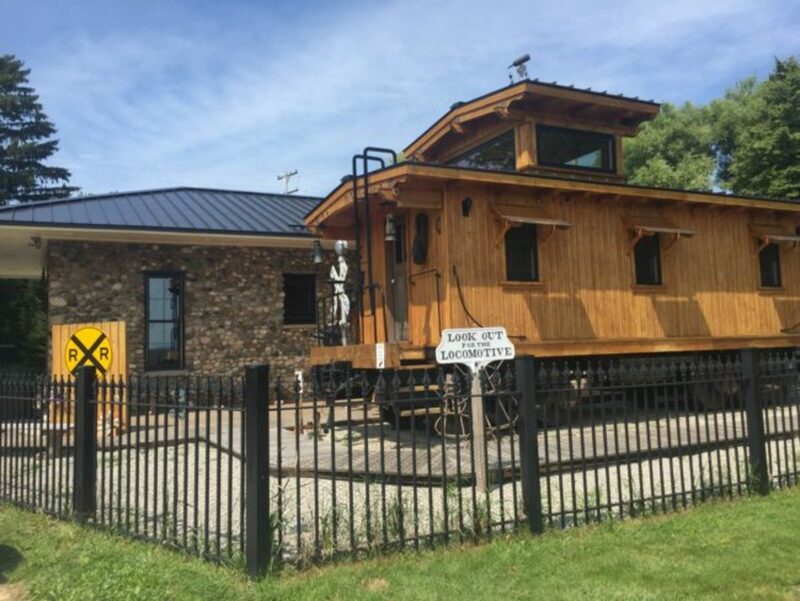 Here are our eight "Michigan must-dos" when visiting, as the locals say, "up north." Kick off your travels with a beautiful bang. Nothing says "relaxation" like the ability to sit and watch the sunset—drink in hand, breeze in your hair. (Hashtag: vacation goals.) 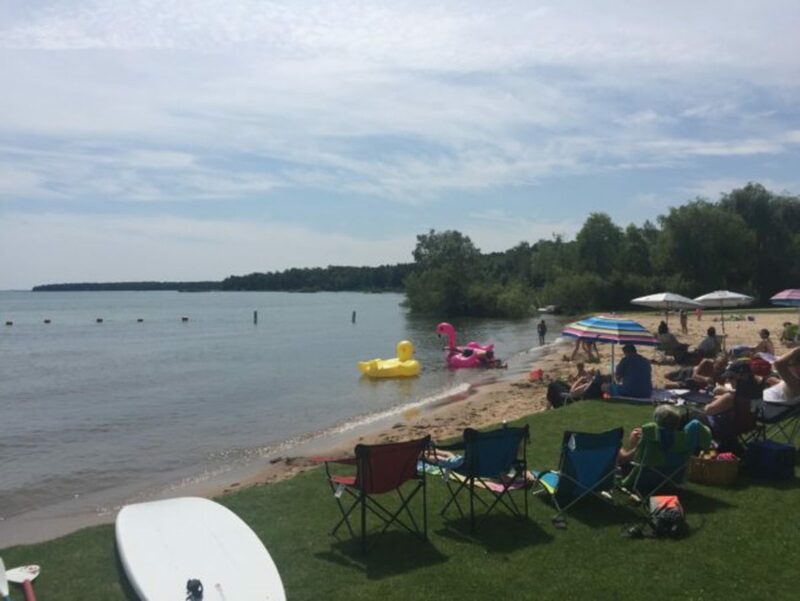 There are so many picturesque places to catch the colorful panoramic sky in Traverse City—the beach at popular Clinch Park is a good one for starters. But I prefer my seasonal sunsets paired with a nice rosé and a hotel rooftop. We got a prime spot for sunset watching at Hotel Indigo. The rooftop bar serves light bites and mean margaritas. One look and one sip, and your pre-vacation troubles will all melt away. Stretch your muscles and grab your water bottle—you&apos;re going to need it. Sleeping Bear Dunes National Lakeshore is a non-negotiable must-visit destination. 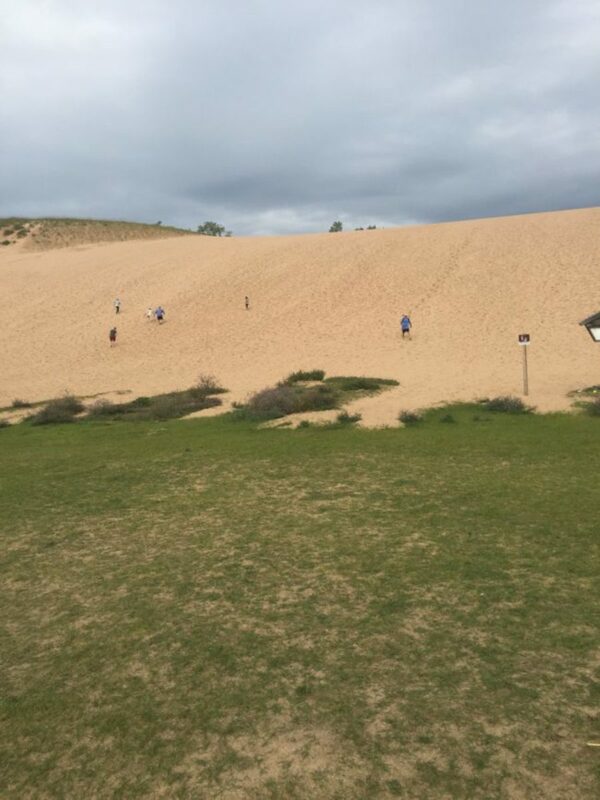 The steep and towering dunes are equal parts intimidating and exhilarating. 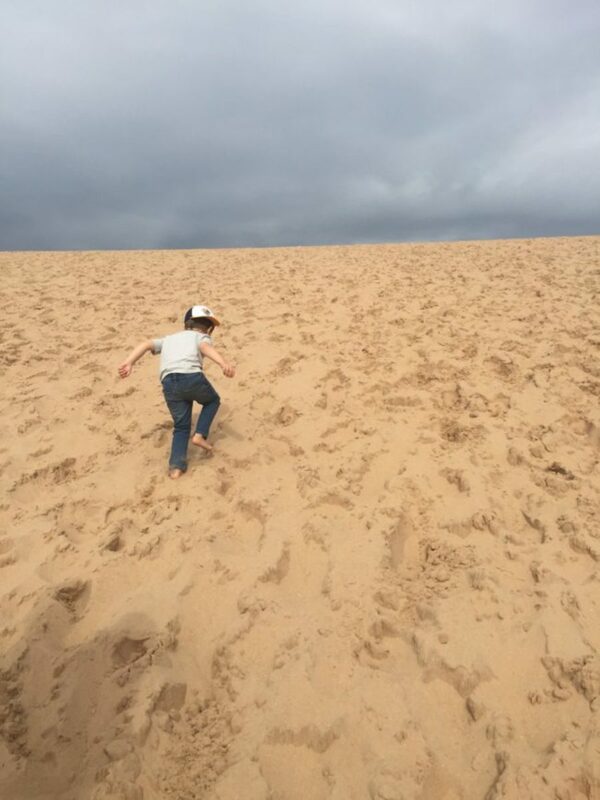 But once your feet sink into that pure soft sand, you know you just have to keep on going. I trekked up the hills with a 20+ pound two year old in tow (tip: bring the Bjorn! ), while my five-year-old son blasted passed us with the energy of a relentless puppy dog. He then barreled down giggling the whole way. It was a workout, an accomplishment, and a total sight for sore eyes. Lake Michigan is sprawling in size and breathtaking in beauty. The best way to experience its vastness is in a tall ship. We hopped aboard Traverse City Tall Ship Company&apos;s Manitou boat for a two-hour breezy (borderline windy!) sail on one of the great lakes. There are three daily outings: the noon sail, an afternoon ice-cream sail, and a sunset evening sail. 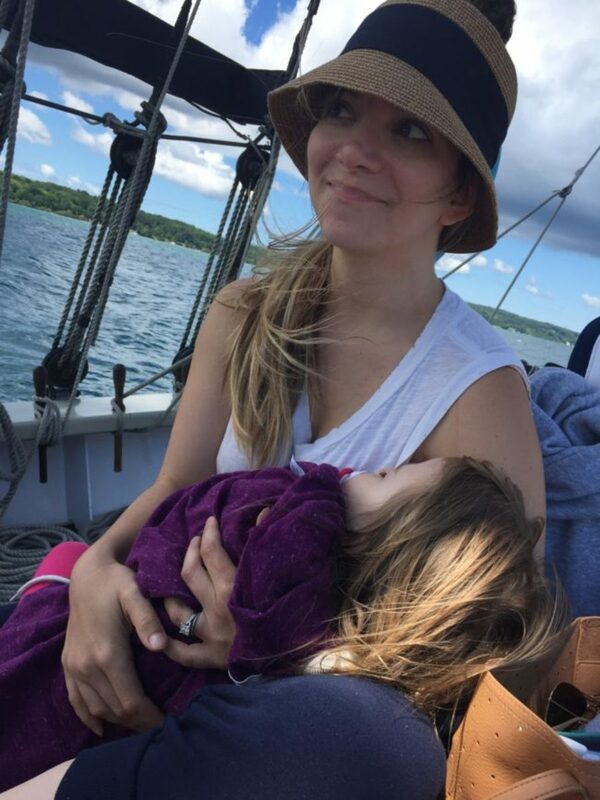 I was a little nervous about being confined on a boat with two small kids for two hours in the afternoon, but they absolutely loved it--and it was an awesome reminder to take some risks and step outside your comfort zone. Best of all, the crisp air and motion resulted in an epic nap for my youngest. Win-win. 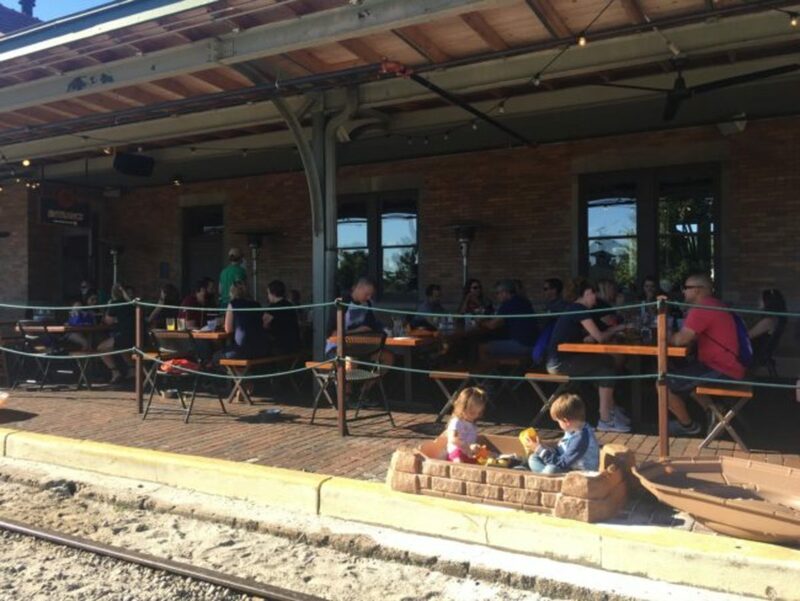 Traverse City is most definitely a place for foodies and families. There&apos;s a reason Mario Batali frequents this town (seriously, just check out his Instagram feed)—it&apos;s chock full of cool restaurant concepts and rising-star chefs. But that doesn&apos;t mean you have to drop a lot of dollars on a high-end dining experience. Most of our family&apos;s favorite meals were casual, laid-back, and easily affordable. 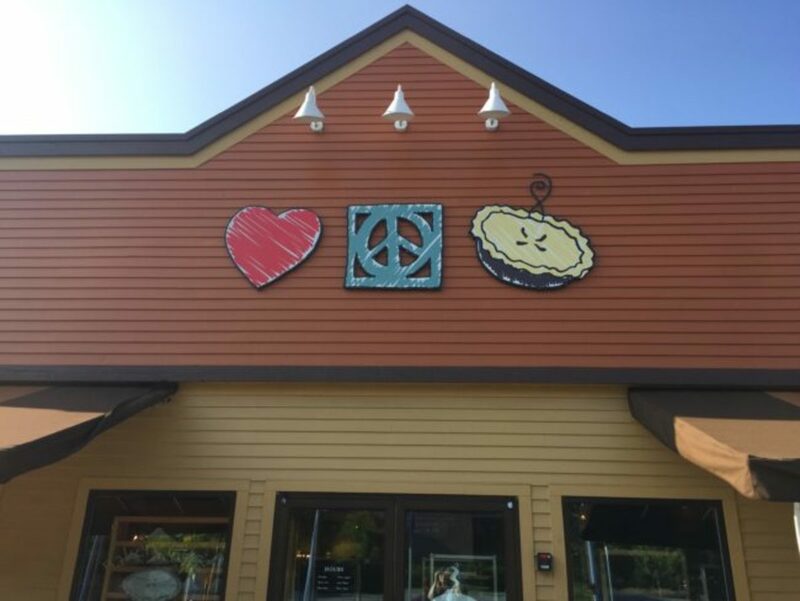 Breakfast: Having a hearty wholesome breakfast or sweet snack is as easy as pie at the original Grand Traverse Pie Company. Peace, love, and a slice of cherry pie. With ample help-yourself seating and plenty of coffee for the sipping, this is a great spot to grab a quick and casual bite. My suggestion? Skip the slice (then again I&apos;m not big pie person!) and go with a pumpkin muffin—crumbly, moist, and sweet as, well, pie. Tip: Car meals will happen. You have to be flexible and roll with the punches on road trips with kids. Not every bite is going to be gourmet, and some might have to scarfed down in gas-station rest stops. It&apos;s all par for the course. Lucky for us, our Traverse had all space (and cup holders!) we could ever need for our, eh-hem, many coffees and juice boxes. We put a big gap brown grocery bag between the middle row bucket seats to serve as a garbage to keep things tidy and neat. We also did a bit of grocery shopping for snacks and diapers and other essentials during our trip. While we didn&apos;t require a Costco run, it&apos;s worth noting that the Traverse boats 24 storage areas throughout the vehicle and an impressive 98.2 cubic feet of maximum cargo space. 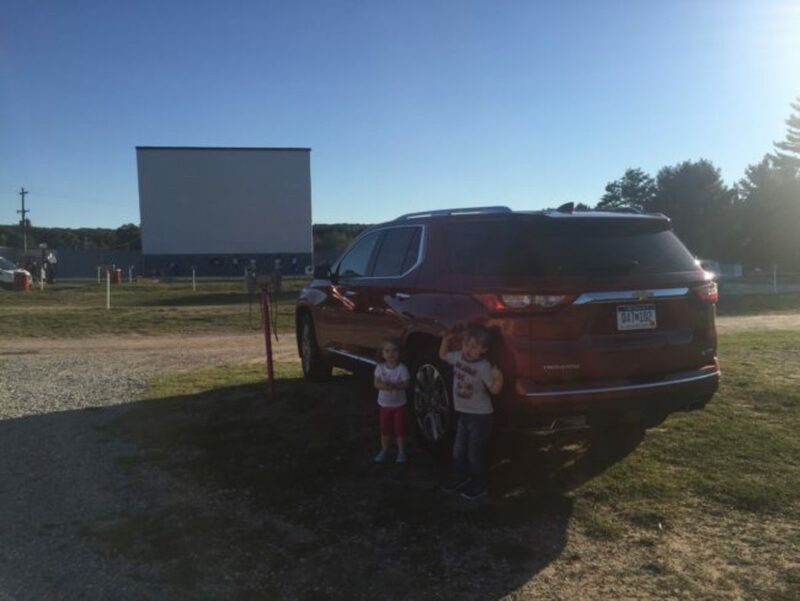 Transport yourself back to the 1950s with an evening trip to the Cherry Bowl Drive-in movie theater, just about 40 minutes and 18 miles Southwest of Traverse City. This theatrical throwback really is a sight to be seen. Everything about it evokes nostalgia, from the bare-bones playground to the car-side speakers to the shanty putt-putt mini-golf game to the pink checkered interior of the diner-style concession. And, yes, there&apos;s even a cliched dancing hotdog cartoon before the movie starts. The movie time is listed as "dusk"—and the Cherry Bowl hotline nor its Facebook page shares a more specific time, so we erred on the early side—which was a mistake. Darkness descents fairly late in Michigan in late summer—so we ended up waiting for two hours for the movie to finally start. 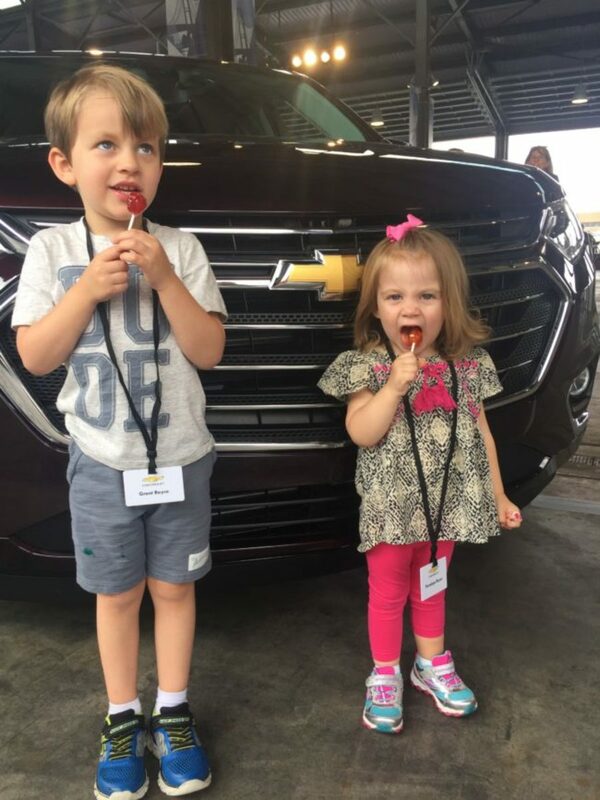 Luckily, we were able to entertain the kids, thanks to the incredible connectivity of our Chevrolet Traverse. Between our favorite Pandora stations and I Heart Radio, we had a mini dance party before starting our own personal pre-movie movie in the car! Our Traverse came with its own WiFi hotspot—so the hubby was able to stream Moana in the car and sync his audio through the car&apos;s BlueTooth. Both kids climbed in my lab, and I reclined my comfortable passenger seat for a little nap, while Dad retired to the game-changing third row for some peace and quiet. He was able to easily get back there, thanks to the new enhanced Smart Slide second-row seating. The curbside seat is capable of tipping up and sliding forward, even with a forward-facing child seat in place to provide easy access. Hoorah! 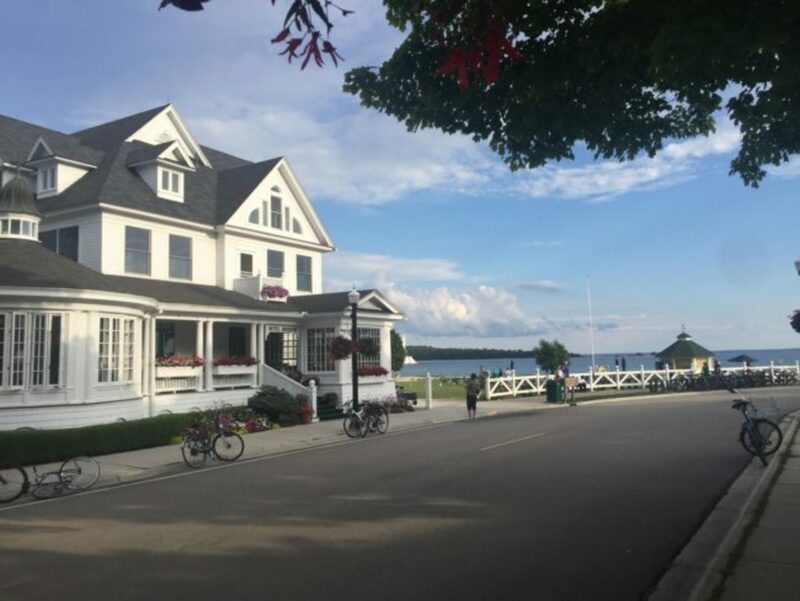 There are plenty of ways to boost the local economy and fill your luggage with some shopping in charming downtown Traverse City. From boutiques to antique books store, fun finds for every budget are just a hop, skip and jump away. Be sure to stop at Kilwin&apos;s for a cone and some signature fudge. Every Saturday, there&apos;s a big farmer&apos;s market in the center of Traverse City with loads of booths and stands and tasting opportunities. 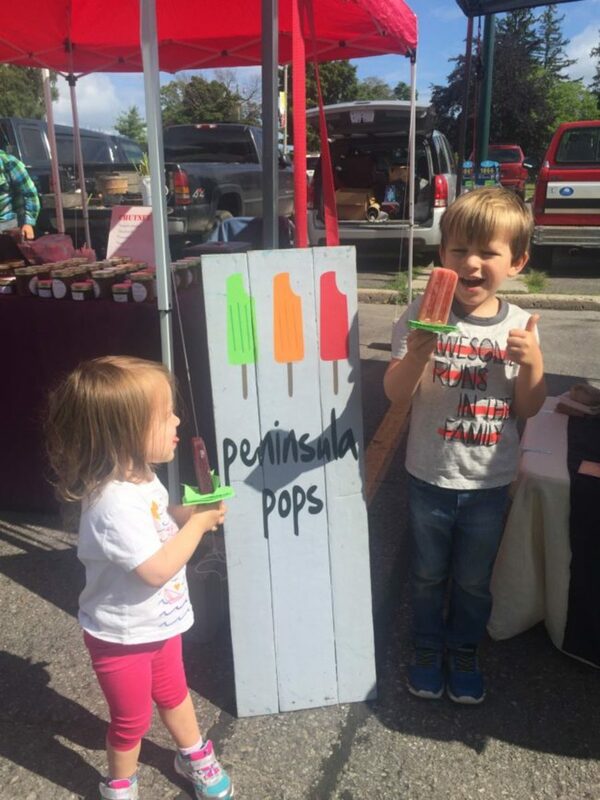 We stopped for local plums, which were the juiciest sweetest bite-size fruits I have ever devoured; and the kiddos just had to have a homemade Peninsula Popsicle. Want to see yours kids "blissed out" to the max? 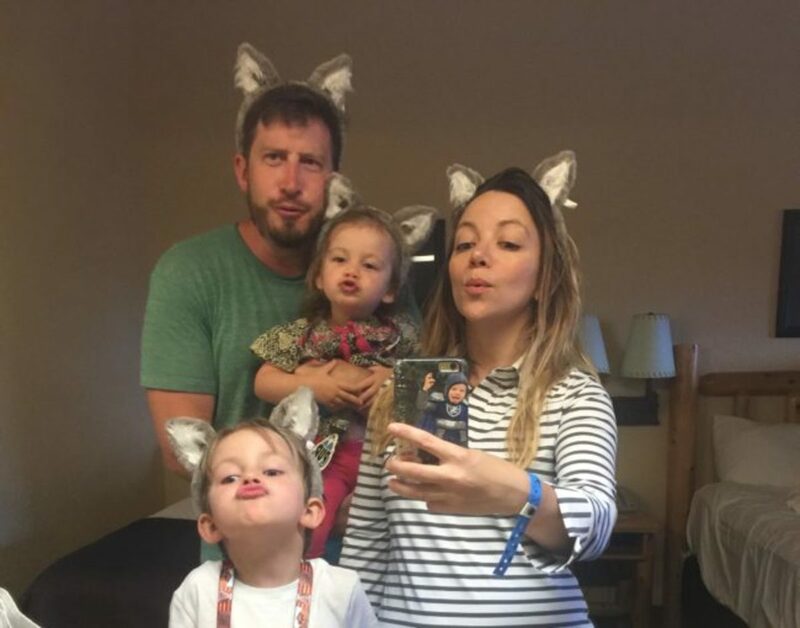 Surprise them with an extra night at Great Wolf Lodge in Traverse City. The indoor water park is perfect for less idyllic weather conditions, and its not-so intimidating size makes it manageable for parents with kids of varying ages. My son was psyched to discover he was tall enough to go on all the slides and my daughter was elated to show off her rudimentary swimming-skills in the two-feet deep lazy river--approximately 40 times around and around and around and around. 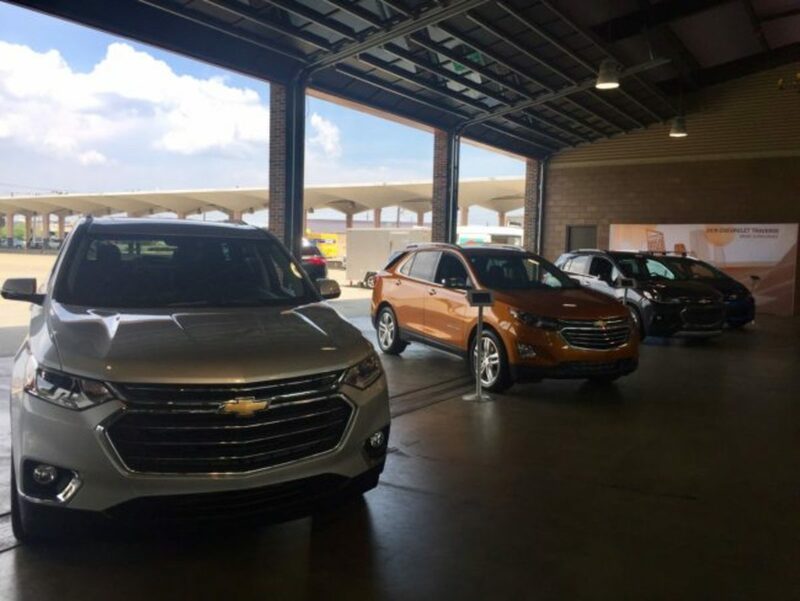 Traverse City gave us a taste of Northern Michigan and we wanted more, so we decided to hop back in our Chevy Traverse to check out a few more destinations. Leelanau State Park: Just north of Northport is beautiful Leelanau State Park. 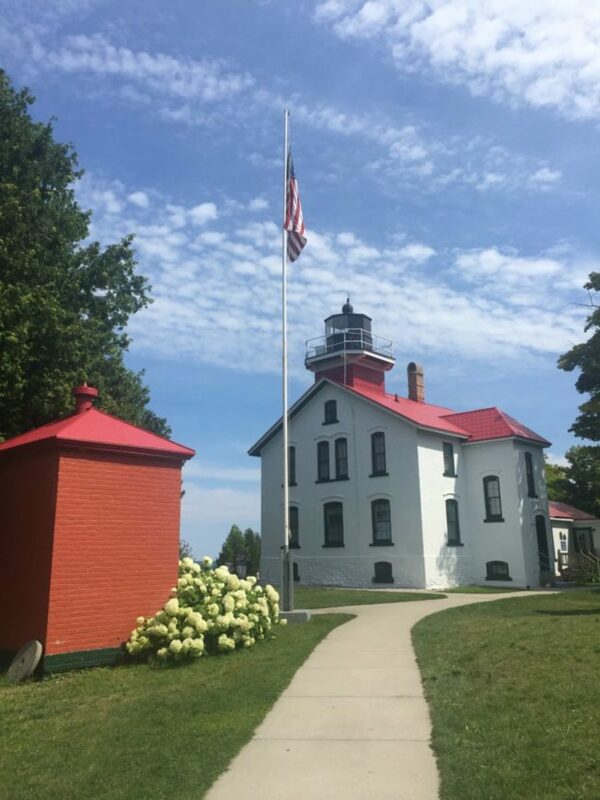 Check out the 1,300 acres of shoreline and woods, the Grand Traverse Lighthouse Museum, and an idyllic setting for hiking, swimming, fishing, and more. 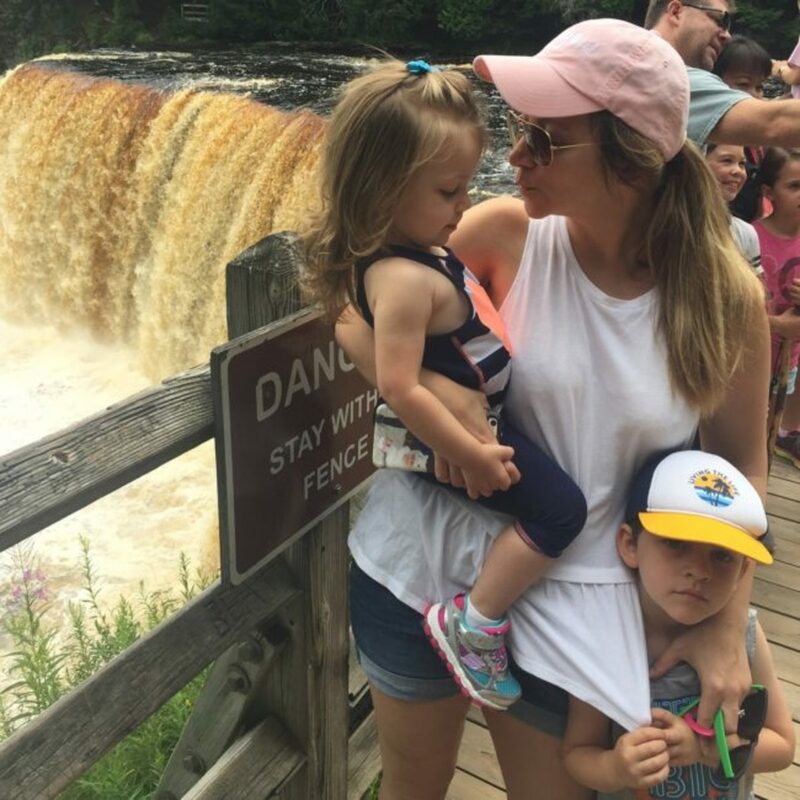 Tahquamenon Fall State Park: A trip to the upper Peninsula wouldn&apos;t be complete without a stop at the spectacular Tahquamenon Fall State Park. The Upper Falls is one of the largest waterfalls east of the Mississippi, dropping nearly 50 feet. It&apos;s truly something to be seen... and heard. 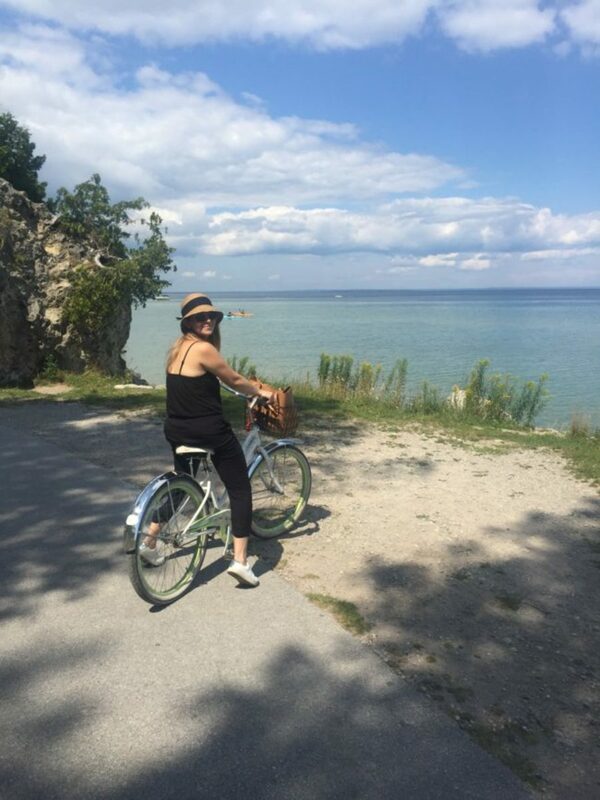 Mackinac Island: We loved out Chevy, but had to briefly say goodbye to it for a ferry trip to Mackinac Island. That&apos;s right, you can travel the car-free island&apos;s eight mile circumference by foot, by bicycle, or by horse and carriage only. It&apos;s a charming place to slow down, take in nature, and eat ALL the fudge. This is not a sponsored post. Chevrolet flew our family to Michigan, hosted us in Traverse City, and, of course, gave us a totally awesome 2018 Traverse to drive. That said, all opinions are still our own.